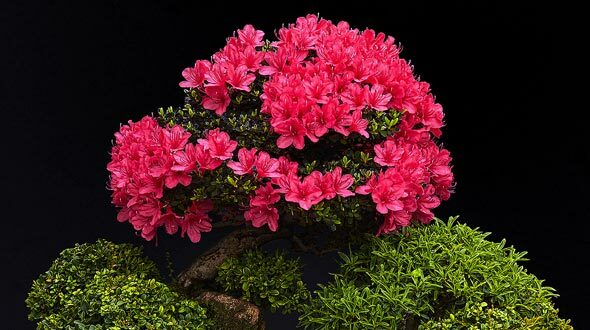 The Azalea Bonsai Tree has a thick base and thus is very good for a bonsai and it also looks like a completely grown miniature tree. But, the fact is that it is not really a tree, it is a shrub. Normally the Azalea only blossoms once a year but their flowers are incredibly rich in color and look striking. The best part of keeping an Azalea bonsai is that it needs very less maintenance. As the Azalea does not need much direct sunlight, it is better to place in somewhere where there is indirect light. It is necessary to keep the Azalea in a container that has good drain and also make sure that you water it at least two times everyday. Also make certain that the soil does not erode from the holes that are at the base of the container. It is not very important to have any particular type of soil to grow Azalea. Cutting off the leaves and flowers once they perish will help in good growth. Make a point that you carefully trim just the fresh growth each year once they flower and once more during mid summer when the fresh sprouts develop. See that you fertilize the bonsai once in six weeks as well. It is necessary to prune at least 1/5 of the root ball in order to fit in the container at least once in 3 to 5 years. Therefore you will have repot every year and if needed trim the root ball. Make sure that all the air pockets are covered with soil while you are repotting. During winter, make sure that the plant is kept away from rough snow and ice. It would be better to place it in a room where there’s less sunlight and must be watered once a week in order to guarantee appropriate care.